My sister loves sugar cookies, and while they aren't my favorite cookie, there is something to be said for an unadulterated sugar cookie -- chock full of butter and sugar, of course; pale, pale yellow, seemingly void of any flavor, but it's usually the recipes made of the simplest of ingredients that resonate in one's memory and stand the test of time. 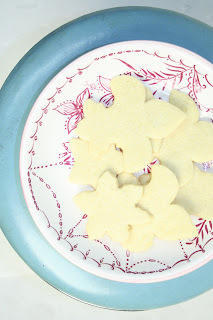 This week's Tuesday's with Dorie recipe is hosted my Ulrike of Kuchenlatein and is Grandma's All-Occasion Sugar Cookies and I was pretty excited to test it out to find a go-to sugar cookie recipe that my sister will approve of. It's been a busy week, so I wasn't able to employ any amazing variation to the recipe (although the measure of a great sugar cookie should be judged at its essence, I think -- just like a cupcakery should be evaluated by their vanilla-vanilla first and foremost). Roll-out cookies haven't had much of a presence in my baking as the nuisance of dough sticking on my counter was (as with the aforementioned bane of my existence -- pie dough) quite a deterrent. I didn't even have cookie cutters, so over the weekend I stopped by Surfas for some great, classic shapes. Fleur de lys? I know my friend would love them already! The dough was manageable, but did soften up rather quick, leading to a slightly deformed snowflake during transfer to the baking sheet. Most of them made it to the oven, although there was a mishap involving the floor, and I sprinkled a bit of sanding sugar over the tops. Next time I'll surely involve some colored icing. All in all, it was quite a tasty recipe. The cookie baked up firm, but after a bit of time, they did definitely soften up. I may prefer a sugar cookie with more bite to it, but we'll see what the verdict is with my sugar cookie afficionado sister. I love your shapes! Awesome job! I wasn't excited about making these, but they won me over. There is something to be said for your basic butter-sugar punch. These turned out lovely! I'm not a huge fan of sugar cookies either, but these were pretty tasty.